A court hearing in Aleg, Mauritania, yesterday ruled to reject the appeal request of Biram Dah Abeid, prominent anti-slavery campaigner, along with his colleague Brahim Bilal Ramdhane. Dah Abeid and Ramdhane are President and Vice-President, respectively, of IRA-Mauritania, one of the most important anti-slavery groups operating in the country today. 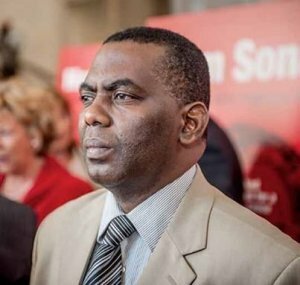 Along with his colleague, Biram Dah Abeid, a presidential candidate in Mauritania's 2014 election and winner of the 2013 UN Human Rights Prize, was arrested in November 2014 during a peaceful anti-slavery march. In January 2015, he was sentenced to two years' imprisonment on charges of 'inciting trouble', 'belonging to an unrecognized organisation', 'leading an unauthorised rally', and 'violence against the police'. Biram and his lawyers boycotted the trial, noting its clear political bias. Even the removal of the appeal hearing from Nouakchott, Mauritania's capital, to Aleg, a smaller town, was politically motivated, preventing many supporters of IRA from attending. In a letter written from his prison cell and released by global activist network Avaaz, Biram noted: "I refuse to give up. I will not be silenced. I will not stop challenging the dogma which is used to legitimize slavery here". This is the third time Biram Dah Abeid has been imprisoned for his work campaigning against slavery. Despite repeated attempts to get IRA, which he founded in 2008, officially recognised by the Mauritanian authorities, these requests have been ignored and its members harassed and imprisoned for belonging to an illegal organisation. The rejection of this latest appeal further demonstrates that the Mauritanian government's claim to oppose slavery is merely lip-service: despite making slavery a 'crime against humanity' with a sentence of 20 years imprisonment only last week, this continued persecution of anti-slavery activists shows how little progress is really being made. Indeed, only one person has been convicted under anti-slavery legislation since 2007, and, despite government assertions to the contrary, the practice of slavery remains widespread. Estimates vary, but between 4% and 17% of the country's population are believed to be enslaved at the moment. Slavery in Mauritania is particularly difficult to escape, as slave status is hereditary and linked to race: slaves are drawn from the caste of 'Haratin' or 'Black Moors'. Biram Dah Abeid now faces remaining in prison until the end of his two-year sentence, but refuses to be stopped by this set-back. International support for the abolitionist movement and pressure on the Mauritanian government is rapidly growing, but more needs to be done to force the government to make genuine reforms. UNPO calls upon the Mauritanian Government to release Biram Dah Abeid and Brahim Bilal Ramdhane immediately and unconditionally, and to allow them to enjoy their right to peacefully assemble and fight against the cruel practice of slavery. UNPO will continue to press the international community, including relevant United Nations bodies and the European Union, to raise this matter with the Mauritanian Government at every opportunity.